I’ve been walking around barefoot a lot these days. It feels only natural. So much so that shoes now feel kind of weird on my feet… Who’s born with shoes anyways!? Now that I’ve returned back into an Urban setting, I intend to seek out green spaces as much as possible. I needn’t go far - the garden’s right outside. Planting our soles in the Earth and allowing a moment to reconnect to the ground beneath us benefits our ENTIRE being. 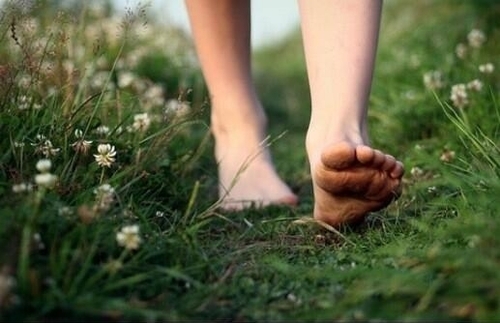 Known as Earthing, research has supported in all ways that more time spent with Nature in this way aids our mental state, emotional wellbeing and immune strength. (N.B: Yoga barefoot outside surrounded by trees = Samadhi, surely). For those out there who appreciate the science/spiritual overlap: Free electrons from the Earth surface are some of the most potent antioxidants known to humankind.Our feet have many nerve endings which are electronically conductive, so the electrons are absorbed when we connect to the ground barefoot - reducing the amount of oxidation occurring in the blood and thus reducing cell deterioration (i.e. aging). To me, this experience reveals itself as a complete removal of any and all previously perceived problems… Clearing the mind, relaxing the body and bringing an immediate sense of calm from within. There is no pressure from outside sources of life, only a deep sense of inner peace that reminds me I am a human being first and foremost, not a human doing. It’s the most reviving way to start my day and put me in a good thinking space. In Japan. there is a centuries-old medicinal method known as Forrest Bathing, which has the same concept and includes Earthing. It revolves around spending time outside, really basking in all the deliciousness! Bathing has seen a recent resurgance as inside living and time spent in offices has taken its toll on communities, with people seeking solace from stressful/confining environments and returning back to that super soothing world just beyond the door. May this be a loving reminder that the Earth is always there, not only to hold you, but to boost you too. For Pachamama wishes not only for us to survive - but to thrive and live our best lives! Go ahead’n get your Grounding on.